The most recent menu at ‘The Montpelier Basement’ supper club I run with ‘E’ in Bristol featured a dish we were quite pleased and fairly smug with. A starter-sized portion of superb fresh Cornish mackerel rolled in oats and fried, served with a parsley and red onion salad. On the side, in some glassware shaped like miniature milk bottles, we served a garish pink rhubarb ketchup. Rhubarb and mackerel go really well together, and it seemed to be appreciated by the diners so I thought I’d share the recipe. Believe it or not, we found the rhubarb ketchup recipe in Phil Vickery’s ‘Favourite Food – The best of British cooking’. An inspired charity shop find. I’d normally instantly discard any of the ex Ready Steady Cook crew’s literary output to a convenient furnace, but for some reason, I fought down the gag reflex, and choked back my rising bile and flicked through. Sold! It’s actually a really decent book, full of interesting recipes and features on good British produce. No one was more surprised than me. First of all, you’ll need to make the Rhubarb ketchup. 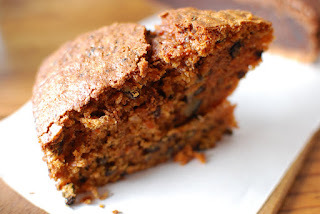 This is supposed to mature for at least a month, but we used it within two days of making it, and it tasted fine. Perhaps a little sharp, it’ll definitely improve with age. But you don’t have to wait if you don’t want to. 500g rhubarb cut into 2cm chunks and washed well. Place the rhubarb in a stainless steel pan. Add the 50ml water and cook over a gentle heat until you have a thick stew, about 10 mins. Liquidize then pass through a fine sieve. Straightway pour the ketchup into a sterilised jam jar or Kilner jar. Securely seal and place the jar into a saucepan with a tea-towel or cloth in the base to keep the glass off the bottom of the pan. Pour in enough warm water so that the jar is just covered. Pop a thermometer in the pan and heat the water to 90C. Then turn down the heat and leave for 20mins bang on, making sure the temperature stays exactly the same. This will sterilise the ketchup. Carefully remove the hot jar from the water and place on a wooden board or tea towel, as glass jars will sometimes crack if placed on metal or cold surfaces. Cool then leave for at least a month to mature in a cool dark place (And for up to 3 months). Once opened, eat within a week. 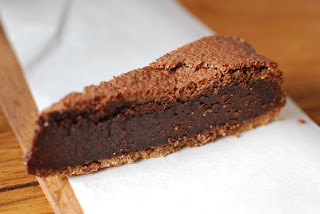 The following recipe is for a more substantial portion than we served at the supper club. To make the red onion and parsley salad, start by running the sliced onion under a tap, just to take a little of the rawness out of it. Dry it and toss with the parsley, the extra virgin olive oil, Lemon Juice. 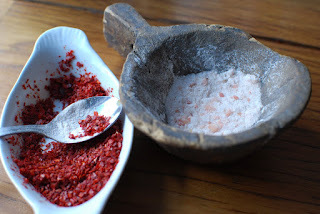 Taste and add the Vinegar if you think it needs it. Season. Olive oil and butter for frying. 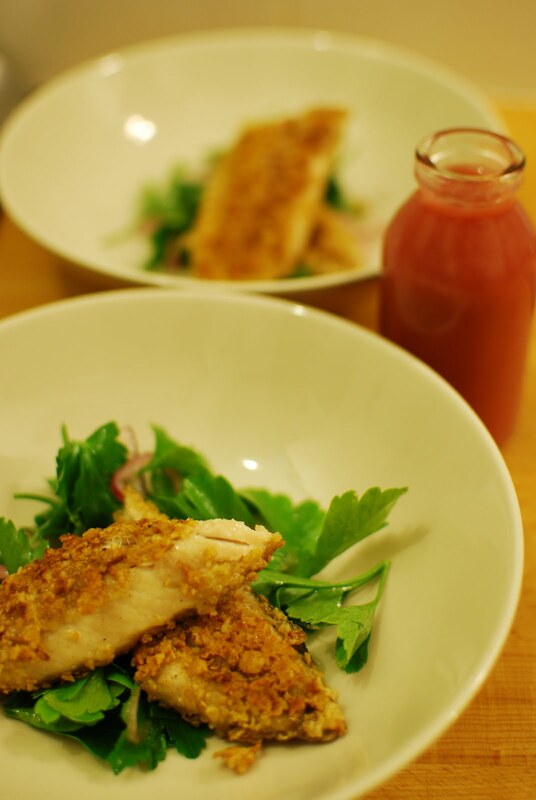 Press your mackerel fillets well into a plate filled with the oats, making sure both sides are well covered. Shake off any excess. Heat oil and butter in a frying pan over a medium to high heat. Fry the mackerel fillets, skin side first for around 3 minutes (until the skin is golden and crispy). Flip over and cook for approximately 2-3 minutes until golden. Place a handful of the parsley and red onion salad on the centre of the plate. Lay the mackerel fillets across the salad, skin side down. Serve with the rhubarb ketchup on the side. 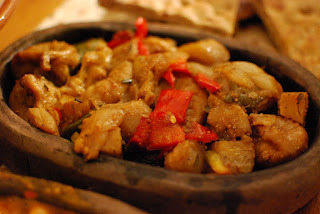 Thinking back on my formative years growing up in Essex, although admittedly not an expert, I thought I was reasonably au fait with all manner of Turkish food. Something of a gourmet, even then. I ‘knew’ that the doner kebabs from the van parked opposite the Watermill Pub were quite tasty and reasonably pleasant (the tightly permed owner was a bit tasty in a fight as well, apparently). Those served up from the burger van near the BP Garage in the town centre were to be avoided. I possessed an opinion on the relative merits of every doner vendor in town. I had no idea that my horizon was so miniscule, my knowledge of Turkish food began and ended with kebabs. I was a philistine. Having just returned from a rather fantastic few days in Istanbul, this point was, almost quite literally, rammed down my throat at every turn. Despite having developed a more mature and sophisticated knowledge of Turkish cuisine, moving on from my kebab munching, pint swilling younger self I was still surprised to find that eating out in Istanbul was a fantastic experience, almost without exception. From the classier restaurants down to the most modest street vendor’s offerings. Even the cheapest doners from the most decrepit looking places in the non-touristy end of town were sublime, bearing no resemblance whatsoever to the processed, thawed out meat on a stick that gets carved up in the UK. To say I was impressed with Istanbul’s food offerings would be something of an understatement. In the few days I spent stuffing myself silly in Istanbul, one of the places that pleased and charmed me the most was Datli Maya. 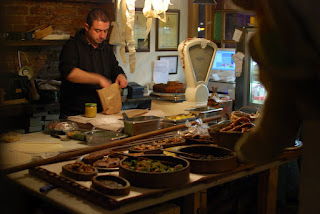 Located in the twisting hilly streets of the trendy Cihangir district, opposite the Firuzağa mosque, this tiny restaurant was an absolute gem. I’d been tipped off about it on my pre-trip research, the excellent Istanbul Eats and Eating Asia blogs singling it out for praise, with particular emphasis on the chef Dilara Erbay, who is apparently a bit of a character on the Istanbul restaurant scene, well known for sourcing superb ingredients and not being bound by convention when cooking classic Turkish dishes. 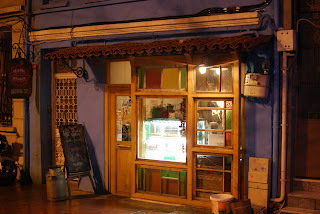 As soon as you walk through the door, you’re confronted by the glow of an old wood-burning oven, the heart of Datli Maya. Laid out around it, tables heaped with delicious looking cakes, Turkish pastries and salads. 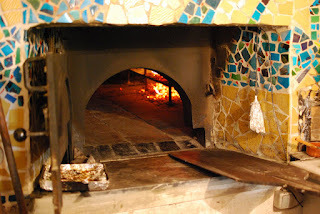 In a corner, a chef was expertly rolling and shaping dough for ‘pide’ a type of Turkish pizza. We were greeted enthusiastically. It’s ridiculously tiny and cramped, and it’s hard to believe all this was going on in such a small space. Our first visit, more of a recce, was at lunchtime and after a bit of shuffling, head scratching and clarification we finally went for a set menu each (encompassing a drink, a pide each, a salad and a cake) and were ushered through a corner doorway and up a steep flight of stairs, unbelievably through a modern commercial kitchen, complete with smiling chef and pounding Turkish folk music, round a corner and into a tiny and slightly battered but very comfortable dining room with windows overlooking the square outside. In the corner I spied an elaborate Turkish tea urn. 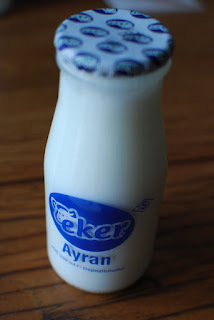 It was serve yourself but instead I’d gone for a bottle of yoghurt, a popular drink in Istanbul. It was surprisingly tart and unsweetened at first, but after a while I found it quite pleasant. Apparently it’s a good choice when eating grilled meats. 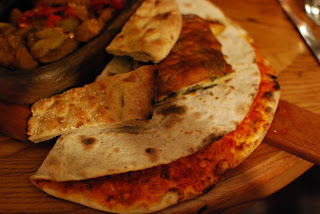 Datli Maya’s style is a modern take on traditional Turkish village food, with pretty much everything being cooked in the wood burning oven downstairs. 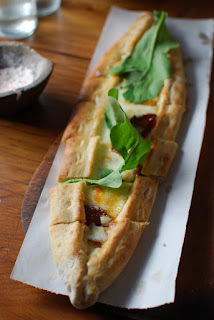 Our pide arrived from the very same furnace, served on wooden slats. 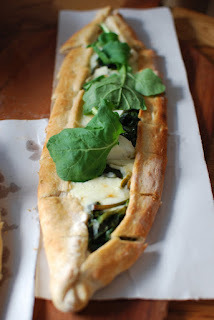 ‘E’ had gone for ispanakli keci peynirli - spinach and goats cheese. I’d chosen afyon kelle sucuklu - spicy Turkish sausage and cheese. Both were hot, crisp, stuffed full of ingredients and absolutely delicious. A huge bowl of winter salad arrived. 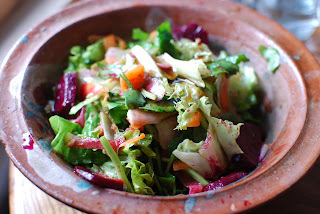 Full of beetroot, fennel and all sorts of other good stuff, it was coated with a beautiful orange scented dressing with a touch of sourness, which we found out was from the addition of sumac. Finally, to finish we helped ourselves to tea in dainty glass cups, from the urn in the corner to wash down my large slice of decent carrot and walnut cake.‘E’ had a piece of rather amazing, flourless chocolate cake. A fantastic lunch, in a very relaxed and friendly restaurant. Our bill? Just over £7 each! I think you’ll agree, a bit of a bargain. In fact we enjoyed it so much, and were so intrigued by the food and the menu that we returned a couple of days later, but in the evening, for dinner. There are no reservations so we arrived around 8pm and hoped for the best. Again, squeezed into the downstairs kitchen, the stove roaring away to one side, we ogled the table groaning with food, made our selections and clambered upstairs, through the kitchen, nodding to the chef’s rocking out to the crazy sounding Turkish beats and took our seats in the crowded dining room. Our food arrived as it came, and it seemed like we might have been just a bit greedy in our ordering. Our table was covered in dishes. Nodding grimly at each other in silent acceptance of the challenge ahead, ‘E’ and I waded in without mercy. Some kind of spinach and cheese pastry seemed a bit overcooked, dry and unappetising – we tossed that to one side after a few exploratory bites. 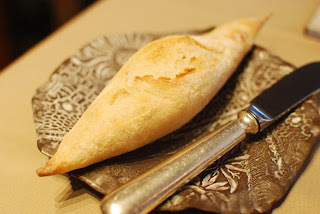 However, ‘antakya ispanakli borek’ (which the menu tells me is a Antiochian style pastry) was delicious. Folded over on itself and containing cottage cheese, onion, spinach and chilli peppers. We scoffed it down. 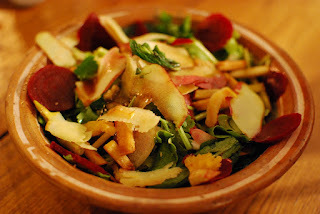 Another massive bowl of excellent winter salad appeared, with the same orange and sumac dressing and we helped ourselves to this in between sampling from the four clay casserole dishes, that had been cooked in the wood-burning stove. 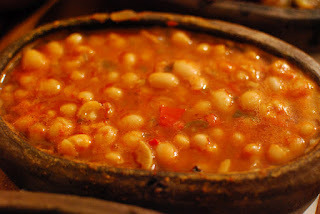 Slow cooked white beans, to me, were surprisingly reminiscent of Heinz baked beans, but creamier and fresher. I’m not complaining, it’s a good thing and I thoroughly enjoyed it. A bowl of braised spinach root was superb. Tasting perhaps more like peppery celery rather than spinach. It’s not an ingredient ‘E’ or I had encountered before, and inspired us to keep an eye out for it in the UK. Baked figs with peppers, wasn’t a favourite of either of us. Cooked figs, for me never seem to be as interesting as a perfectly ripe fresh fig. The whole dish just seemed a little bland when compared with some of the other food. 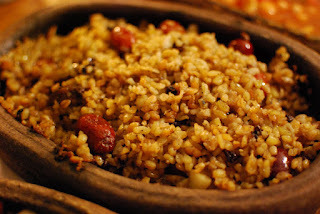 Smoked bulgar pilaf with chestnuts, carob and silverberry was much more successful and intriguing, neither of us having any idea what silverberry are (I now know silverberry comes from a tree and apparently has a sharp, but sweet taste). Mystery ingredients included, it was delicious. Dessert absolutely stole the show. 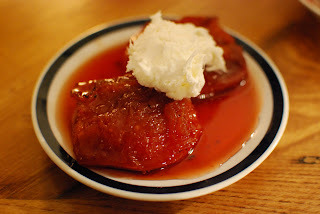 We were stuffed silly, so shared an oven-baked quince topped with a dollop of karacadağ yogurt. It was amazing. Sticky, caramel flavored with cloves combined with the fresh, thick, richness of the yoghurt. Superb. This is something I’ll definitely be having a go at when quinces are back in season in the UK. Altogether, our dinner bill for two came to around 70 Turkish Lira, which is about £25. That’s stupendous value for money. I found Datli Maya to be welcoming, fun and just a bit hip. One object we spied tucked away in the kitchen sums it up. A tambourine, I could well imagine the chefs using it whilst dancing around the prep area, to the bonkers upbeat Turkish music blasting out. It seems like that kind of place. 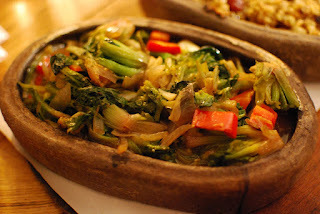 The food was inventive, fresh and interesting definitely unlike anywhere else we ate in Istanbul. It’s almost unique in my experience to quite literally, walk directly into the kitchen, see the available dishes laid out and say ‘that looks nice, I’ll have one of those’. I should also point out, so that pescetarian ‘E’ and I could share everything, I ate a complete meal without any meat in it whatsoever, and amazingly, didn’t really miss it much. Don’t worry meat fans, I’m still an unrepentant carnivore, but it made a nice change. If you ever find yourself in Istanbul, I'd highly recommend Datli Maya for it's great value, delicious modern take on traditional Turkish food. Go. Soho seems to be cornering the market on small, trendy yet definitely unpretentious restaurants, focusing on excellent seasonal ingredients, daily changing menus and simple but accomplished cooking. Following the arrival of the rather fabulous Duck Soup, just a few streets away, recently opened 10 Greek Street feels very much in the same mould. Which, I should add is definitely a good thing. Having almost walked past the very austere, grey and functional frontage, which belies a much warmer and light filled dining room beyond. 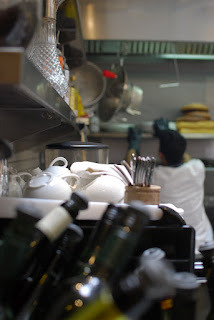 I strode in at Friday lunchtime, bang on 12 in the hope of grabbing one of the stools at the bar, front row seats overlooking the comings and goings in the kitchen and available on a first come, first served basis. I was in luck, and within 20 mins of my arrival, the whole restaurant was buzzing and packed to the rafters. It has to be one of the airiest and light filled kitchens I’ve ever seen, the glass raised ceiling above floods the whole area with natural light and on a cloudless spring afternoon I couldn’t imagine anywhere nicer to be seated. 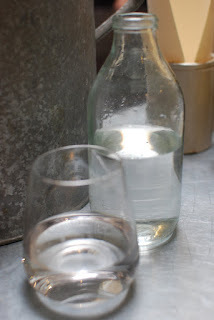 Water served in recycled milk bottles was a nice touch, it’s always good to see a bit of subtle inventiveness with the more mundane tableware. 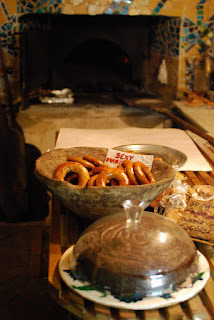 Some good bread to nibble, a chat with the cheerful and friendly staff who were more than happy to recommend their favourite dishes off the menu, and a glass of Schloss Vollrads Reisling to wash it down I was all set to order. A word about the wine list. Almost all of it is available by the glass. £4 is the average price for 125ml, with the most expensive glass coming in at £5.50. This is very smart pricing and promotes matching wine to individual dishes without spanking the wallet or purse too hard. It has to applauded. 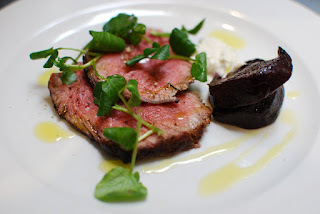 My Welsh Black Beef, Beetroot and Horseradish starter was exactly that. No frills, perfectly rare, a beautiful piece of meat simply cooked with classic accompanying flavours. It could be argued, a bit unadventurous, but then the counter argument is, why mess about with such superb ingredients? It was absolutely delicious, and living with a pescetarian and eating a lot less meat than I’d like, I’m inclined towards the positive. 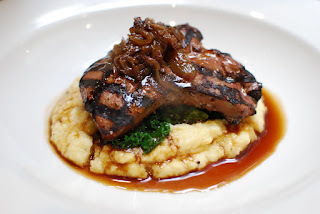 Calves Liver, Polenta, Kale and Balsamic Onions was superb. The liver was perfectly cooked, seared on the outside and still pink in the middle, with a rich almost buttery taste. Again, simple, beautifully cooked, unmucked about with food, allowing the excellent ingredients to really be appreciated. Washed down with a big glass of recommended red (errr which I can’t remember the name of) I truly couldn’t have been happier. 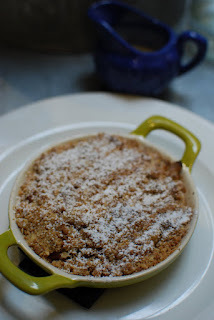 Quince and Apple Crumble had my name all over it. Happy to see a really decent sized individual portion with an accompanying jug of crème anglaise, and the tantalising offer of ‘if you want more, just ask’ left hanging in the air. I glided towards the end of the meal in a state of rapture. So, one of the most pleasant lunches I’ve had for quite some time. 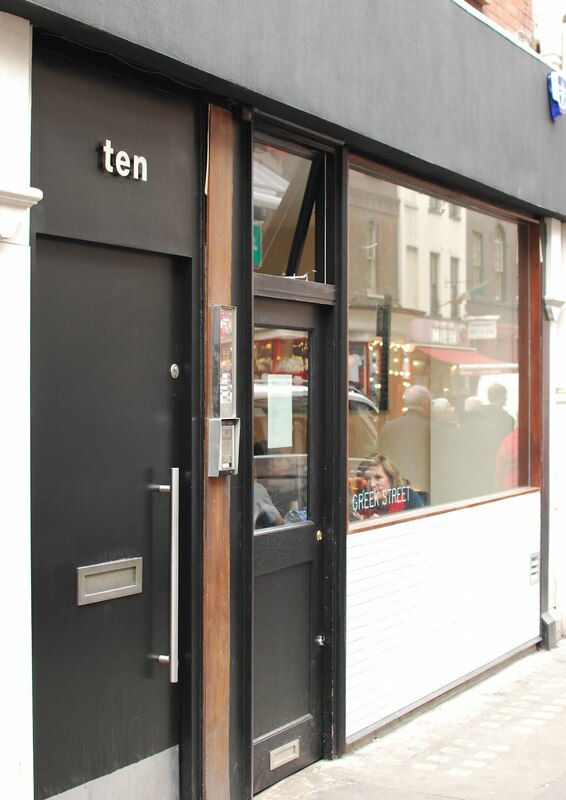 10 Greek Street is just a bit special. The menu is packed full of interesting dishes. The food is simply and beautifully executed. 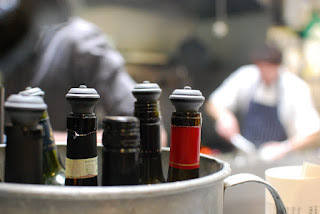 The wine list, priced as it is, mainly by the glass is highly approachable and good value. The service was welcoming, cheerful and polished. I really couldn’t fault any aspect of my meal. Bravo. My lunch for one, 3 courses, 2 glasses of wine and tip came to just over £40. Believe me when I say it’s a complete bargain. I highly recommend you go, and make sure to grab a seat at undoubtedly the best table in the place, the bar overlooking the action in the kitchen. 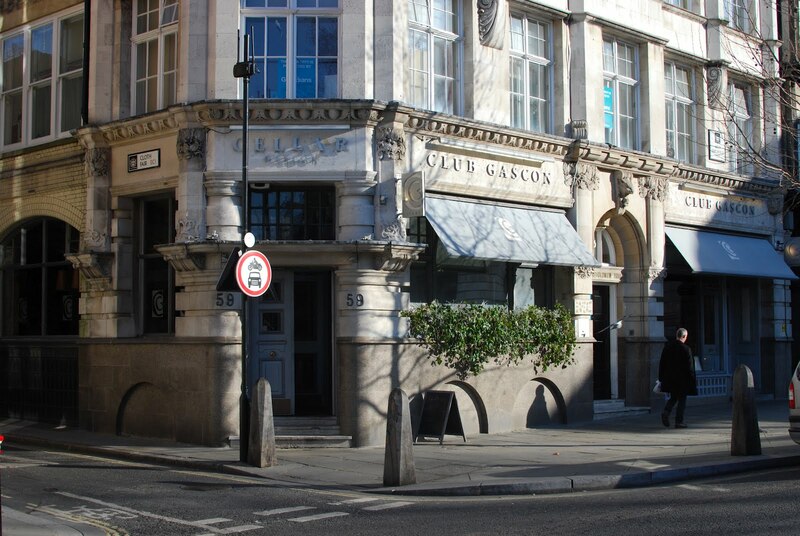 Club Gascon is a restaurant I’ve wanted to eat at for quite some time. I worked in the Smithfields area for years, and I often walked past, stopping, intrigued to read the menu displayed outside, and then ambling off back to the office. If I’m honest, I think I found it a little bit intimidating. The restaurant is housed in a very grand building. The classically attired front of house and waiting staff gathered around the booking desk near the door are just a little off putting to ‘window shoppers’ like me, trying to peer past them into the restaurant within. The menu itself was a little frightening to a younger me too, passionately French but also full of interesting, expensive ingredients and somewhat experimental flavour combinations. To my mind this was posh, grown up dining for city slickers spanking those lunchtime expense accounts. I just wasn’t ready. 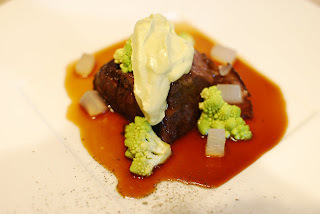 Last week, older, grizzled, a veteran of a thousand amuses bouche and with an expanding waistline to prove it, I returned with a confident swagger to Chef Pascal Aussignac’s Michelin starred restaurant. I was there to review lunch for the Great British Chef’s blog and far from being intimidated; this time around I was excited. For research, I’d been flicking through Pascal’s recipe book, Cuisinier Gascon and a lot of the ingredients and pairings were unusual to say the least. 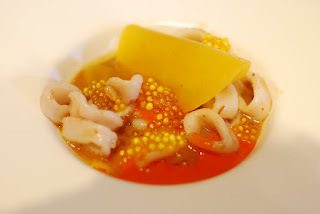 Despite being fiercely proud of Gascony and its classic food heritage, the book also features among other things, a tomato coulis with Fishermans Friends as an ingredient and white asparagus with treacle foam. What with the book along with studying the current restaurant menu, I’d come to the conclusion that the food being served here, in my experience, is unlike anything else in London. And I don’t know about you, but for me, that’s an exciting thought. Taking a seat, the restaurant was smaller and more intimate than I imagined, but unusually, when compared to other Michelin ‘temples to fine dining’ touches of real character were evident throughout. The bar, adorned with the most incredible and riotous flower arrangement I’d ever seen, was (I was informed by the waiter) put together by Chef Pascal Aussignac himself. Apparently, he does all the restaurant’s flowers. It’s his second great passion after cooking. I also have to mention the very unusual tableware. Handmade in Gascony, it was absolutely beautiful to look at and I had to fight down a very strong ingrained Essex urge to ‘half-inch’ just a little bit. Casting my eye around the restaurant, as you’d expect in the city at lunchtime, my fellow diners were a mostly well-heeled, business suited crowd, but not exclusively so. I didn’t for one second feel out of place or uncomfortable in my flip-flops, verging-on-the-obscenely-tight-cycling-shorts and Hawaiian shirt. There are various menu options at lunchtime. I just had to go for the tasting menu priced at £55, although the ‘Dejeuner Club’ menu (£25 for 3 courses) definitely caught my eye. In actual fact, I might pop back at some point and try that too because it looks like a complete bargain. A jug containing a ridiculously tall Parmesan crisp was deposited on my table. I couldn’t help but wonder how many of these get broken as they’re brought from the kitchen. Nevertheless it was delicious. Next, a slate containing a curious amuse selection. Due to the combination of the almost impenetrable French accents of the waiters and my rubbish hearing I wasn’t entirely sure what I was eating until later. 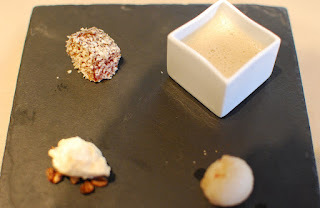 The Smoked Chestnut veloute was superb, I could have done with a bit more of this. The Peanut ice cream with crispy Pearl Barley was also nice, but I’m not sure the sweetness worked against so many savoury offerings. 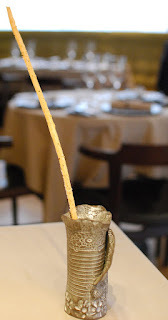 The Nogoshi Pear dipped in Hazelnut Oil was refreshing, but a bit lost on me. I didn’t really get the Hickory Jelly and Chestnut Powder at all. I thought it just a bit too subtle. But then everything changed. The most amazing bread I’ve eaten for ages. Served with both smoked and Foie Gras butter. The sourdough in particular was bloody amazing, light but with an incredible crust and an almost smoky flavour. It was phenomenal. Almost as equally amazing, the Brioche rolls had a perfect crisp shell like exterior and almost sweet cloud like texture inside. I could have happily sat there all day eating the bread to be honest. 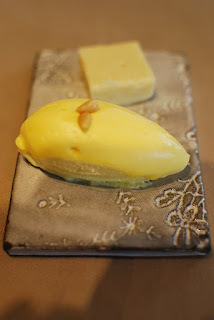 The butter, particularly the whipped Foie Gras version was rather nice, a bit salty with just a hint of flavour from the fatty foie gras. Sea Urchin veloute, Cauliflower Pulp & Crisps arrived, and bloody hell; it was one beautiful looking plate of food. The waiter, having obviously sized me up straightaway, told me not to eat the decorative grass. The veloute was rather lovely, light, creamy and quite intense. I wasn’t entirely sure about the accompanying crisps. They looked amazing, but as is often the case with fine dining, I wasn’t entirely sure how I should eat them. Dunk them in my veloute? Munch them like giant luxury Quavers covering the table in debris? Combine the different colours to make new flavours? God knows. I took to breaking off pieces carefully and nibbling on them in a dainty fashion. For the record, I believe the flavours to be purple potato, seaweed and scallop. The scallop one tasted best. 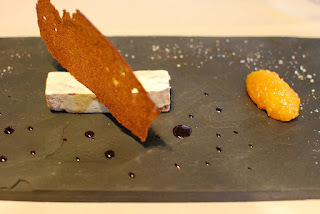 Pressed Foie Gras, Gingerbread; Pumpkin & Fir Tree Marmalade was bloody delicious. The subtle spice note of Ginger is a classic partner for Foie Gras and the tangy sharpness of the marmalade cut through the flavours beautifully. Despite being very rich, it really was superb. Braised Ox Cheek with an Anchovy sauce, pieces of confit Lemon and Avocado Chantilly doesn’t sound like the likeliest combination does it? I started eating, and oh my God, it was amazing. Tender, sticky, intensely savoury, absolutely perfectly cooked. I was lost in the moment, savouring the flavours. What’s that? At this point, somewhat embarrassed I realised that I had been making contented soft whimpering noises to myself whilst eating. Honestly, that doesn’t happen often. This was one of the best dishes I’ve eaten for ages. Loved it. 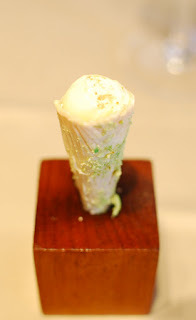 A pre-dessert White Chocolate cone, with crushed Wasabi Pea coating and a Blood Orange jelly filling was unusual and a good bridge between the savoury and sweet courses. 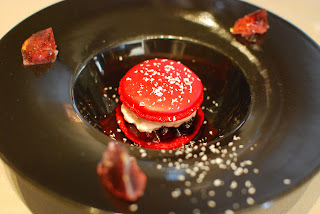 The following dessert of Red Macaroon, confit fruits in Armagnac and Rose Champagne Jelly was perfectly decent, and a nice light way to end the meal, but perhaps lacked the inventiveness of some of the previous dishes. I think as it was so ridiculously wintery outside, I really was in the mood for something a bit more stodgy and filling. The petit four however, win the award for some of the nicest ones I’ve ever seen. They were beautiful, served on a crisp edible chocolate shell. Overall, I really enjoyed lunch at Club Gascon. The service was perhaps a tiny bit more stiff and formal than I’m used to, but that’s to be expected when fine dining in a French restaurant. To be honest, I actually quite enjoy watching real professionals work the room. The food is obviously very French but despite working within this classic framework, it often veers off unexpectedly on a very experimental tangent. I don’t think I’ve seen a menu quite like it. 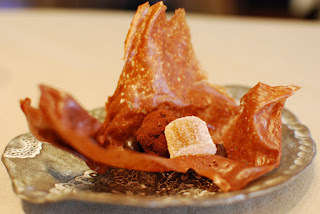 Pascal Aussignac’s food itself is beautifully cooked and extremely interesting. Yes, a few elements didn’t quite work for me. 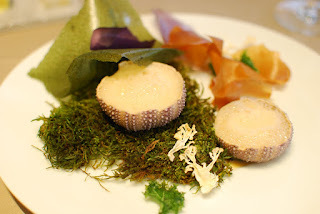 I’m thinking some of the amuses and the crisps accompanying the sea urchin veloute. But on the other hand the Ox Cheek dish in particular stands out as one of the best things I’ve eaten for a long time. At £55 the tasting menu is pretty good value, but as I mentioned earlier, I will definitely be returning to sample the 3 courses for £25 lunch menu which looks to be a complete bargain.